If you are pregnant or breastfeeding, or if you have a baby up to 1 month of age or have thyroid disease (except nodular thyroid disease with heart disease), take as directed above and contact a doctor as soon as possible. Pregnant or breastfeeding women, or babies under 1 month of age: Take as directed above and call a doctor as soon as possible. Repeat dosing should be avoided. It is recommended that thyroid function be checked in babies less than 1 month of age who take KI. Women who are pregnant or breastfeeding should also be checked by a doctor if repeat dosing is necessary. 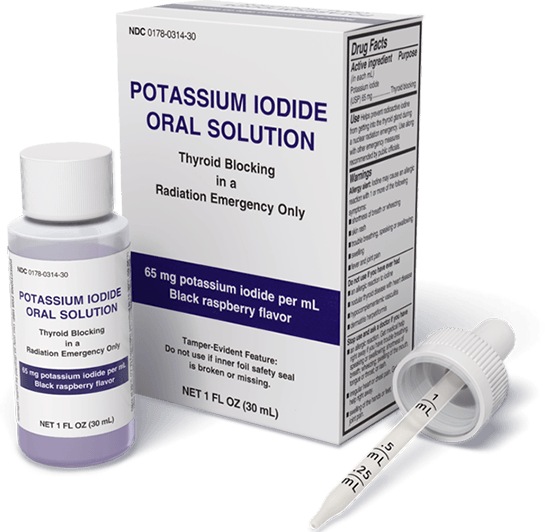 Although these precautions should be taken, the benefits of short-term use of KI to block uptake of radioactive iodine by the thyroid gland far exceed the chances of side effects. Reference: 1. Liquid KI Oral Solution. San Antonio, TX: Mission Pharmacal; 2016.